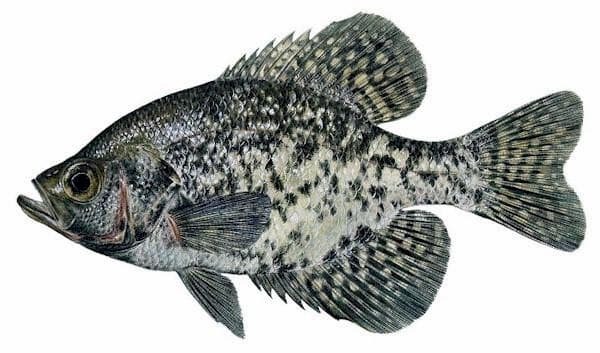 Adult Size: Sexual maturity is reached between 2 and 4 years of age, at which time crappies may be 6 to 10 inches long. Typical crappie fisheries produce fish between 6 and 11 inches long, although crappies exceeding 14 inches and 3 pounds have been caught in Maine. Identification: Closely resembling bass and sunfish species, which have 10-12 dorsal fin spines, crappies possess 6-8 dorsal fin spines. Body form is very deep and narrow (laterally compressed). Coloration is silvery-olive to golden brown, with an irregular mosaic of dark black blotches.